Lamium (Spotted Dead Needle) is originally from Europe and North Africa. This fast-growing perennial functions well as a groundcover and is resistant to deer and rabbits. Its colorful green-and-silver leaves make a soft, attractive accent in landscapes and combination pots. Lamium is an aggressive plant when grown in partial to full shade and can spread rapidly. For best results with Lamium, we recommend using a well-drained soil and a low-but-constant feed program of 200 ppm N. Maintain a pH between 5.8 - 6.2. Growing Lamium with cooler night temperatures will produce a stockier plant with shorter internodes and more intense color. We recommend that you pinch Lamium 5-10 days after transplanting to your final container. Pinch these fast-growers frequently to maintain the plant’s shape for your final needs. Plant growth regulators are not necessary for Lamium. 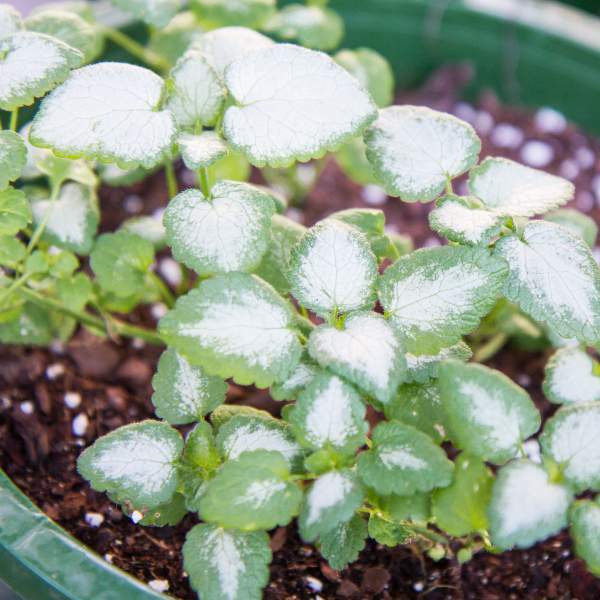 Aphids and whiteflies are the pests to watch for with Lamium. Lamium are not prone to many diseases, but watch for botrytis while the days are short. This grey rot is usually associated with wet or humid conditions. You can prevent botrytis by allowing the plant to dry out between waterings, allowing for good airflow in your greenhouse, and spacing to allow the sun to penetrate to the soil level. The most common chemicals used to treat botrytis are Medallion and Banrot. Use them as a drench according to each label’s instructions. We recommend planting 5 starter plants per 10 inch basket. Use a well-drained soil in your baskets and plant your starter plants deep, allowing the ellepot to be completely covered by the soil. If you are planting 4” pots, 1 plant per pot should be sufficient. When using three liners, plant them in a triangle in the middle of your pot.